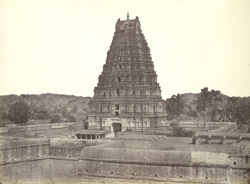 Photograph of the Virupaksha Temple in Vijayanagara. The Virupaksha Temple was founded in the 13th century and rebuilt for the coronation of King Krishnadevaraya in 1510. The tall eastern gopura seen in this view and other renovations are from the 17th century. Annual festivals at the temple celebrate the marriage Virupaksha, a form of Shiva, with his consort, the indigenous goddess Pampa.